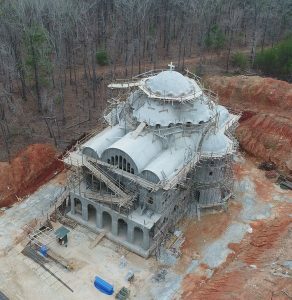 The Panagia Chapel at the Diakonia Retreat Center is in its final stages. To wrap up the building of the Panagia Chapel, His Eminence has asked that each family give the names of their loved ones, living and deceased to be sealed in the Holy Table during consecration and prayed for during each service held in the Chapel forever. When submitting names, it is requested that each family prayerfully considers a sponsorship of $30 or more, as you are able, to the completion of the Panagia Chapel’s roof. We will be collecting the money and sending the total collected to the Metropolis of Atlanta. There are 3 payment options: 1.) Cash, 2.) Check payable to St. John the Baptist Greek Orthodox Church w/Roof Tiles in the Memo Line, 3.) Online via Paypal by clicking the DONATE NOW button below. All donations need to be collected by Wednesday, June 14, 2017. Click here to download the form for the names of your family members. Please print, fill out and return to the office by June 14. Click here to read His Eminence Metropolitan Alexios' Letter concerning the campaign. The Panag ia Chapel at the Diakonia Retreat Center depicts different designs that derive from the Byzantine era. 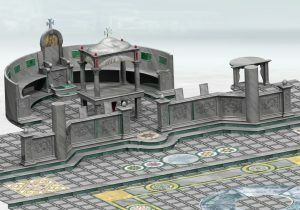 It will allow visitors to connect with a civilization that dates back over a thousand years. By connecting with our roots and traditionthrough the design of the chapel we are engaging our “Ellinochristianikos Politismos,” or our “Helleno-Christian Civilization.” The Panagia Chapel Furnishings project has been undertaken by several different communities and individuals in our Metropolis. By sponsoring different parts of the furnishings to be placed into the Panagia Chapel at the Diakonia Retreat Center, you, or your family, or your community can be a part of this lasting legacy. For more information on what is available for sponsorship, please click here. For more information on how to donate, please contact the Metropolis of Atlanta's Development Office: developmentoffice@atlmetropolis.org or call 404-634-9345. The total donation needed for Doors In Front Of Chapel is $18,000. The total donation needed for Doors On Sides Of Chapel are $8,000. The total donation needed for Doors In Back Of Chapel And Tower is $20,000. The total donation needed for Chapel Wall Windows is $213,000. The total donation needed for Chapel Dome Windows is $48,000. The total donation needed for Front Arch Of Chapel Windows is $13,100. Become a part of the building of this most blessed and monumental testament of our Orthodox faith and our generous faithful. Give a gift to the Panagia Chapel today!